This article is about the Harvard University athletic program. For the Harvard daily student newspaper, see The Harvard Crimson. Harvard's baseball program began competing in the 1865 season. It has appeared in four College World Series. It plays at Joseph J. O'Donnell Field and is currently coached by Bill Decker. Harvard Crimson men's basketball program represents intercollegiate men's basketball at Harvard University. The team currently competes in the Ivy League in Division I of the National Collegiate Athletic Association (NCAA) and play home games at the Lavietes Pavilion in Boston, Massachusetts. The team's last appearance in the NCAA Division I Men's Basketball Tournament was in 2014, where they beat Cincinnati in the Round of 64 in a 12 vs. 5 seed upset. The Crimson are currently coached by Tommy Amaker. Harvard Crimson women's basketball program represents intercollegiate men's basketball at Harvard University. The team currently competes in the Ivy League in Division I of the National Collegiate Athletic Association (NCAA) and play home games at the Lavietes Pavilion in Boston, Massachusetts. The team's last appearance in the NCAA Division I Women's Basketball Tournament was in 2007. The fencing team won the 2006 NCAA team championship in men's and women's combined fencing. Representing Harvard Crimson, Benjamin (Benji) Ungar won Gold in the 2006 Individual Men's Épée event at the NCAA Fencing Championship, and was named Harvard Athlete of The Year. The football team has competed since 1873. They have won ten national championships when the school competed in what is now known as the FBS. They are perhaps best known for their rivalry with Yale, known as "The Game". Sixteen former players have been inducted into the College Football Hall of Fame. Harvard's athletic rivalry with Yale is intense in every sport in which they meet, coming to a climax each fall in their annual football meeting, which dates back to 1875. While Harvard's football team is no longer one of the country's best as it often was a century ago during football's early days (it won the Rose Bowl in 1920), both it and Yale have influenced the way the game is played. In 1903, Harvard Stadium introduced a new era into football with the first-ever permanent reinforced concrete stadium of its kind in the country. The stadium's structure actually played a role in the evolution of the college game. Seeking to reduce the alarming number of deaths and serious injuries in the sport, the Father of Football, Walter Camp (former captain of the Yale football team), suggested widening the field to open up the game. But the state-of-the-art Harvard Stadium was too narrow to accommodate a wider playing surface. So, other steps had to be taken. Camp would instead support revolutionary new rules for the 1906 season. These included legalizing the forward pass, perhaps the most significant rule change in the sport's history. 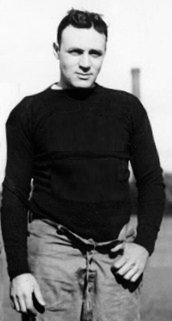 In both 1919 and 1920, headed by All-American brothers Arnold Horween and Ralph Horween, Harvard was undefeated (9–0–1, as they outscored their competition 229–19, and 8–0–1, respectively). The team won the 1920 Rose Bowl against the University of Oregon, 7–6. It was the only bowl appearance in Harvard history. Harvard has won six national collegiate team championships: 1898 (fall), 1899, 1901, 1902 (fall), 1903, and 1904. They have crowned eight individual national champions: James Curtis (1898, fall), Halstead Lindsley (1901), Chandler Egan (1902, fall), A. L. White (1904), H. H. Wilder (1908), F. C. Davison (1912), Edward Allis (1914), J. W. Hubbell (1916). They won the inaugural Ivy League championship in 1975, their only league championship. The men's ice hockey team is one of the oldest intercollegiate ice hockey teams in the United States, having played their first game on January 19, 1898 in a 0–6 loss to Brown. Former head coach William H. Claflin and former captain George Owen are credited with the first use of line change in a game against Yale on March 3, 1923 when the Crimson substituted entire forward lines instead of individuals. The men's ice hockey team won the NCAA Division I Championship on April 1, 1989, defeating the Minnesota Golden Gophers 4-3 in overtime. The Cleary Cup, awarded to the ECAC regular-season champion, is named for former Harvard All-American hockey player, coach, and athletic director Bill Cleary, a member of the U.S. hockey team that won the 1960 Winter Olympics gold medal. The team competes in ECAC Hockey along with five other Ivy League schools and is coached by Harvard alumnus, Olympian, and former NHL forward, Ted Donato. Harvard competes in one of the most heated rivalries of college hockey at least twice each season against Harvard's archrival, the Cornell Big Red, in installments of the Cornell-Harvard hockey rivalry. Cornell and Harvard are the most storied programs currently in the ECAC. Older than The Game by 23 years, the Harvard–Yale Regatta was the original source of the athletic rivalry between the two schools. It is held annually in June on the Thames river in eastern Connecticut. Both the Harvard heavyweight and lightweight teams are typically considered to be among the top teams in the country in rowing, having won numerous national championships in recent years. The Harvard Rugby Football Club is the college rugby team of Harvard. Founded in 1872, Harvard RFC is Harvard's oldest athletic team, and the oldest rugby club in the United States. Harvard competes in the Ivy League, and won the Ivy League Championship in 2007, 2003 and 1994, and were National Champions in 1984. In 2009, the men joined a newly established Ivy Rugby Conference that kicked off as a separate conference in Division 1. Harvard added women's rugby as a varsity sport in 2013, increasing the number of sports the school offers to 42. The NCAA classifies women's rugby as an emerging varsity sport. The Harvard team won the Leonard M. Fowle Trophy in 2001, 2002, 2003, 2004 and 2005, and the dinghies Intercollegiate Sailing Association National Championships in 1952, 1953, 1959, 1974 and 2003, the women's dinghies in 2005, the sloops in 2001 and 2002, and the team race in 2002 and 2003. The team was ranked 11th nationally in 2013 according to Sailing World. Before the NCAA began its tournament in 1959, the annual national champion was declared by the Intercollegiate Association Football League (IAFL) — from 1911 to 1926 — and then the Intercollegiate Soccer Football Association (ISFA), from 1927 to 1958. From 1911 to 1958, Harvard won four national championships. Inaugural season for the men's team was 1981. The Crimson compete in the Eastern Intercollegiate Volleyball Association (EIVA) and are under the direction of head coach, Brian Baise. Inaugural season for the women's team was 1981. The Crimson compete in the Ivy League and are under the direction of head coach, Jennifer Weiss. Head coach Jay Weiss and his coaching staff have put the Harvard Wrestling program on the map. First established in 1913, the Harvard wrestling team celebrated its 100th anniversary in 2013-14, making the Crimson one of the oldest collegiate wrestling programs in the nation. As part of that celebration GoCrimson.com released the "Top Moments in Harvard Wrestling History" in collaboration with the Harvard Crimson Wrestling team. The team practices and competes in the Malkin Athletic Center. In 1938, The Harvard Wrestling team featured the program's first national champion, John Harkness. Jesse Jantzen ’04 graduated in 2004 as the most accomplished wrestler in Harvard history. The Crimson’s all-time leader in wins (132), win percentage (.910) and pins (50), Jantzen’s accomplishments also include: 2004 NCAA Champion, 2004 NCAA Most Outstanding Wrestler, 3 Time NCAA All-American, 3 Time EIWA Champion, 4 Time NCAA Qualifier. Harvard has several athletic facilities, such as the Lavietes Pavilion, a multi-purpose arena and home to the basketball teams. The Malkin Athletic Center, known as the "MAC," serves both as the university's primary recreation facility and as home to the varsity men's and women's volleyball, men's and women's fencing, and wrestling teams. The five-story building includes two cardio rooms, an Olympic-size swimming pool, a smaller pool for aquaerobics and other activities, a mezzanine, where all types of classes are held at all hours of the day, and an indoor cycling studio, three weight rooms, and a three-court gym floor to play basketball. The MAC also offers personal trainers and specialty classes. The MAC is also home to volleyball, fencing, and wrestling. The offices of several of the school's varsity coaches are also in the MAC. Weld Boathouse and Newell Boathouse house the women's and men's rowing teams, respectively. The men's crew also uses the Red Top complex in Ledyard, CT, as their training camp for the annual Harvard–Yale Regatta. The Bright Hockey Center hosts the ice hockey teams, and the Murr Center serves both as a home for the squash and tennis teams as well as a strength and conditioning center for all athletic sports. Other facilities include: Joseph J. O'Donnell Field (baseball), Harvard Stadium (football), Cumnock Turf and Harvard Stadium (lacrosse), Soldiers Field Soccer Stadium and Ohiri Field (soccer), and Blodgett Pool (swimming and diving, water polo). Harvard Undergraduate Television has footage from historical games and athletic events including the 2005 pep-rally before the Harvard-Yale Game. Harvard's official athletics website has more comprehensive information about Harvard's athletic facilities. ^ a b Baseball: O'Donnell Field. Harvard University Athletics official website. Retrieved January 16, 2011. ^ "Women's Rugby Becomes 42nd Varsity Sport at Harvard University - Harvard". Gocrimson.com. August 9, 2012. Retrieved November 3, 2015. ^ Men's rowing (both heavyweight and lightweight) and women's lightweight rowing are not part of the NCAA and have separate championships. The NCAA does conduct championships for women's heavyweight (or openweight) crews (Divisions I, II and III). See: NCAA Rowing Championship. ^ ECAC Awards and Honors: ECAC Rowing Trophy. Eastern College Athletic Conference (ECAC) official website. Retrieved March 3, 2010. ^ Lodha, Karan (June 6, 2006). "Male Athlete of the Year: Benjamin Ungar | Sports | The Harvard Crimson". Thecrimson.com. Retrieved November 3, 2015. ^ Smith, Mel. "Early American Football Style College Champions 1882/83 – 1890/91". College Football Data Warehouse. Retrieved January 20, 2010. ^ "Harvard 1897–98 Men's Ice Hockey Schedule". Harvard University. Retrieved August 6, 2011. ^ "Men's Ice Hockey- Timeline of Tradition". Harvard University. Retrieved August 6, 2011. ^ "1989 NCAA Tournament". Inside College Hockey. Retrieved August 7, 2011. ^ Wodon, Adam (June 30, 2004). "Harvard Zeroes In on Donato". College Hockey News. Retrieved August 9, 2011. ^ "The Oddest Streak in Rowing". Harvard Magazine. Retrieved December 21, 2012. ^ "Championship Races: Intercollegiate Rowing Association (IRA) Championship – May 31, 2003". Row2k.com. Retrieved December 21, 2012. ^ "Championship Races: IRA Championship Regatta – June 4, 2005". Row2k.com. Retrieved December 21, 2012. ^ "Woodrow Wilson Coached Princeton'S First Football Team, Says Historian | News | The Harvard Crimson". Thecrimson.com. November 8, 1924. Retrieved November 3, 2015. ^ "Crimson elevate women's rugby". Yale Daily News. September 13, 2012. Archived from the original on February 10, 2013. Retrieved September 28, 2012. ^ a b "Americanrugbynews.com". Archived from the original on June 5, 2009. Retrieved July 2, 2012. ^ "Harvard women's rugby named varsity sport". Harvard Magazine. August 10, 2012. Retrieved November 3, 2015. ^ Editors, The (May 2, 2012). "Sailing World's College Rankings, May 2, 2012". Sailing World. Retrieved November 3, 2015. ^ "Top Moments in Harvard Wrestling History". Flowrestling,org. Retrieved February 11, 2018. This page was last edited on 15 February 2019, at 12:55 (UTC).